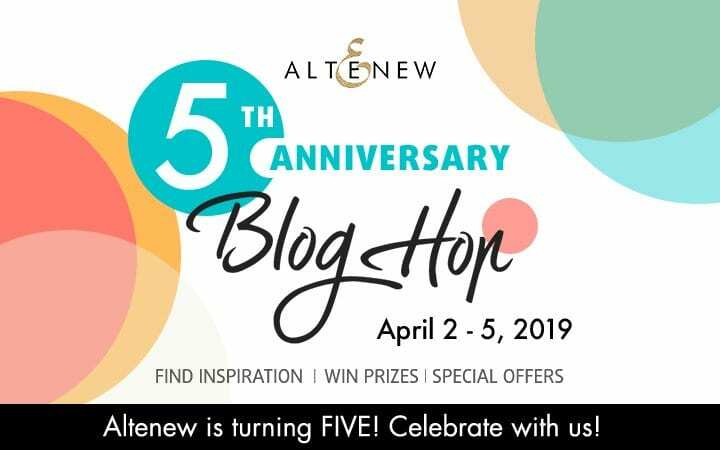 Hi, today’s post is part of a big blog hop with lots of fabulous prizes to celebrate Altenew’s 5th Anniversary! More on the hop below, but for now let’s take a look at the card I made. 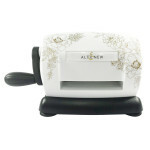 I really enjoyed pulling out my Altenew flower stamps and picked the Perfectly Perfect stamp and die set to work with. I’ve linked all supplies at the end of this post. Compensated affiliate links used where possible at no cost to you. 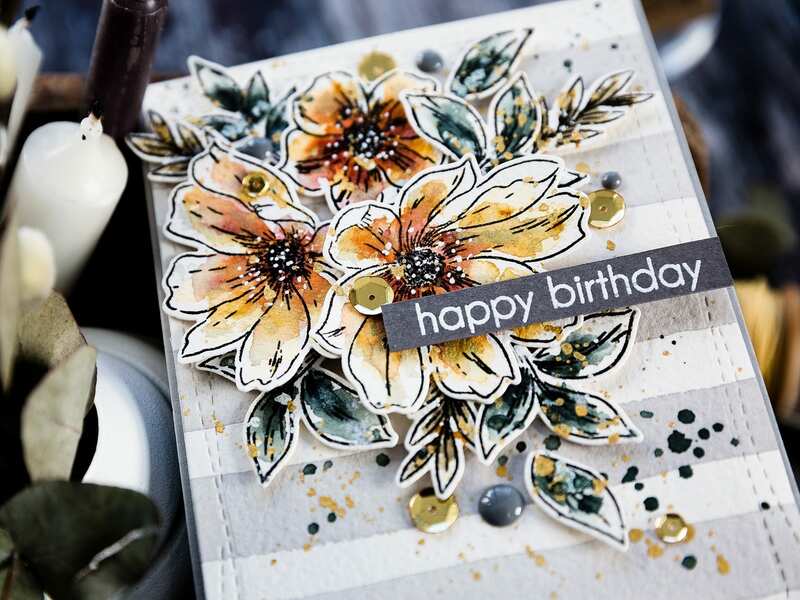 I started by stamping the flowers and leaves from the Perfectly Perfect stamp set in Versafine Onyx Black ink on Arches Cold Pressed watercolour card. 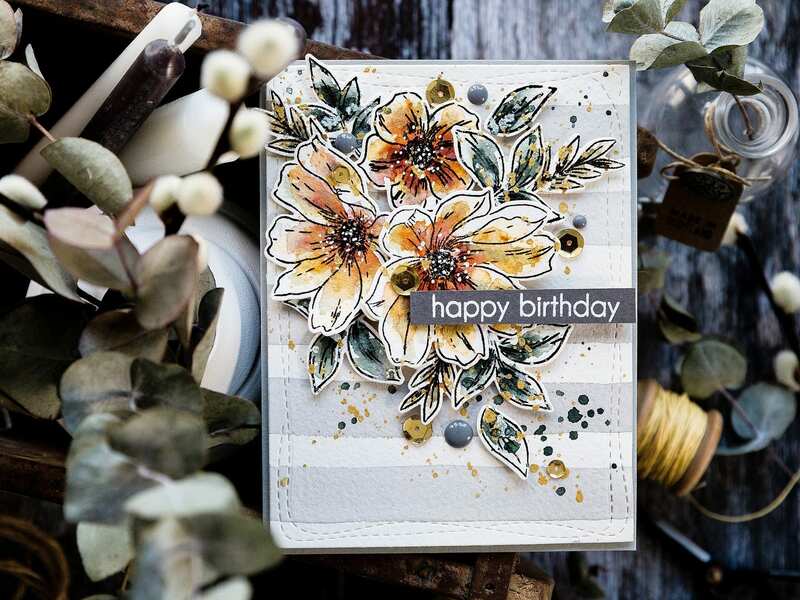 I stamped three blooms and several leaves of various shapes to give variation. I then die cut the images with their matching dies. I watercoloured the die cut images, keeping things light and loose – a quick light layer, followed by a deeper toned layer. I didn’t worry too much about being precise at all! To add to this relaxed look, I then splattered with leftover paint, gold paint and white gouache. I accented the flower centres with a white gel pen too. For the background, I used a broad brush across a panel of watercolour card and a light grey paint mixture and then when dry die cut the panel with a Wonky Rectangle die. Again I added leftover paint and gold paint splatters for interest. I arranged the flowers and leaves cascading down from the top left and then kept them in place with foam adhesive. 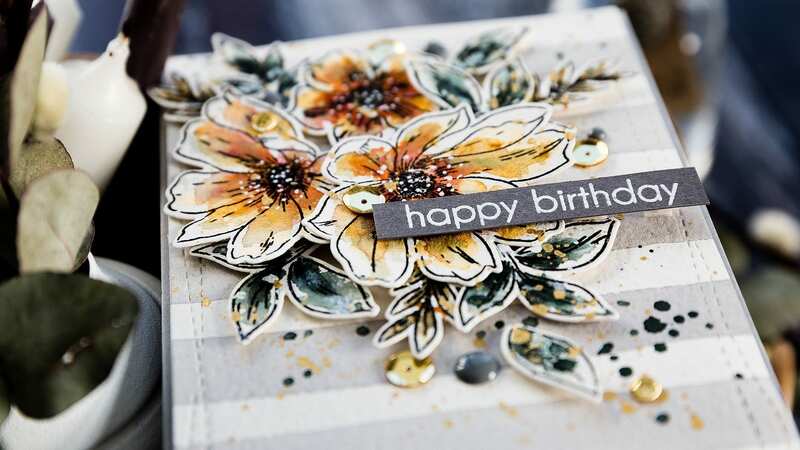 For the sentiment, I stamped a birthday greeting from the Botanical You set in clear embossing ink on Slate card and white heat embossed before trimming to a skinny banner and adding to the card front with more foam adhesive. I added the panel to a card base cut and scored from Smoke card and then finished off with a few enamel dots and gold sequins. 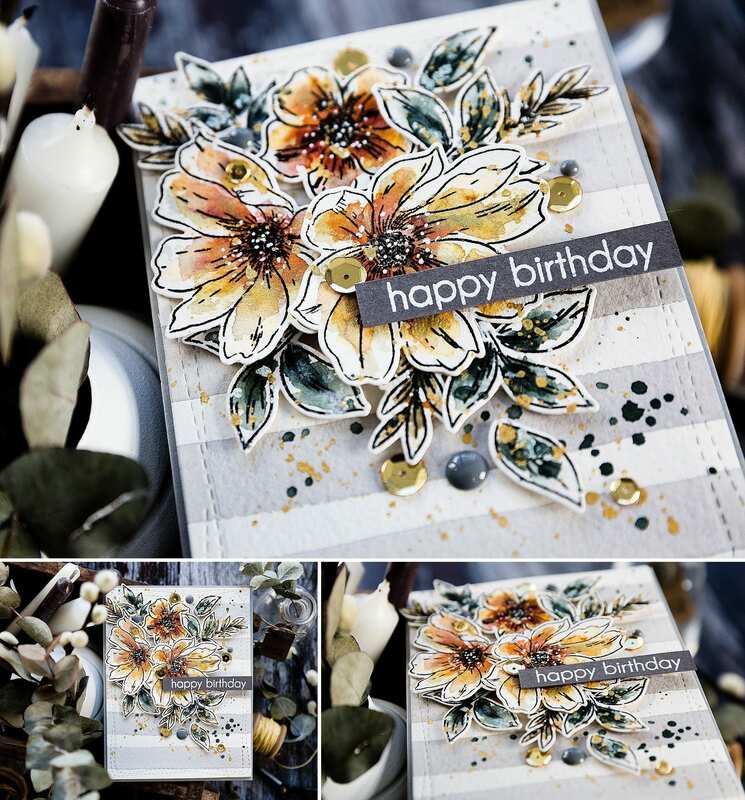 As mentioned above today’s post is part of a blog hop to celebrate Altenew’s 5th Anniversary. Hopefully, you’ve arrived here from the Altenew blog but if not then that is a good place to start. Be sure to leave comments by 12th April 2019 for a chance to win! Thirty-three winners will be chosen at random from the comments left on any of the blogs listed below and will be announced on the Altenew Blog on 20th April 2019. Now it’s time to hop on over to see Lydia Evans! That card is just lovely, the watercolouring is so pretty, love the colours. Love the colors and background. Love the loose coloring technique, it came out lovely. Thanks for sharing and Happy Anniversary Altenew! Gah….. you had me at those beautiful, watercolored gray stripes. 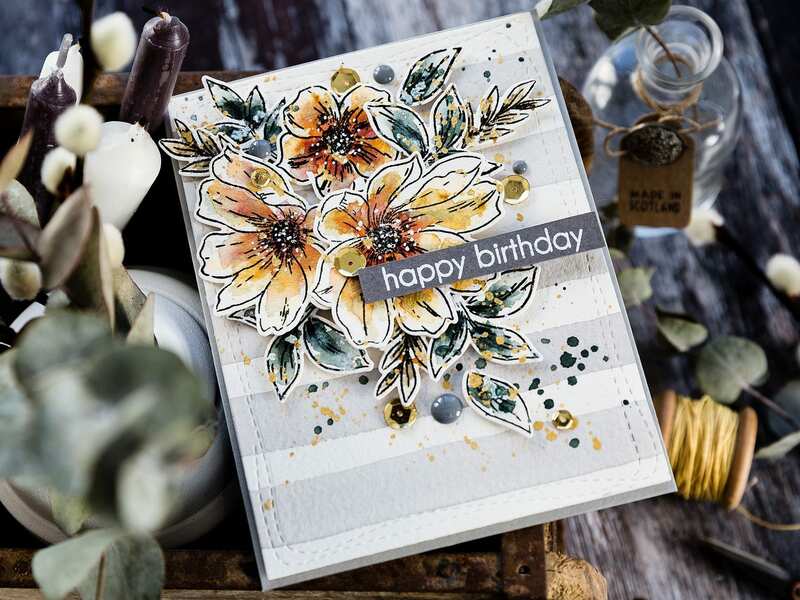 Such an a-mazing floral card!! Wonderful watercoloring. Thank you for posting. luv the muted tones! it’s so classy!